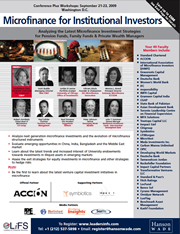 Yesterday, ACCION International announced that it will serve as the official sponsor of a new conference examining the latest microfinance investment strategies. The conference, ‘Microfinance for Institutional Investors,’ will be held in Washington, DC from September 21-23. In addition, ACCION will be sponsoring a book-signing breakfast at the conference, on Tuesday morning, September 22, at which Elisabeth Rhyne, author and managing director of the Center for Financial Inclusion at ACCION, will highlight new case studies from her recently-published Microfinance for Bankers and Investors. Click here, to read the official press release.